DMG Productions explores brain health science and technology. DMG Productions is proud to announce participation with Cogniciti Inc. (Cogniciti) and Baycrest Health Sciences (Baycrest) in an upcoming episode of Innovations with Ed Begley Jr., airing fourth quarter 2017 on FOX Business. Formed in 2010 to help reshape the world of brain health, Cogniciti is a private sector digital health firm with a focus on and expertise in cognitive science. Baycrest is Cogniciti’s parent, Canada’s largest geriatric healthcare institute, and a global leader in the research of memory and aging. Cogniciti and Baycrest are on a mission to use their expertise to bring brain health solutions to people, business, and governments around the globe. This segment will focus on the millions of adults with significant memory concerns. Viewers will learn how Cogniciti and Baycrest is helping tens of millions of adults with normal memory loss find peace-of-mind and effective coping tools, provide education for family caregivers to better support loved ones with dementia, and speed the development of the next generation of dementia drugs. 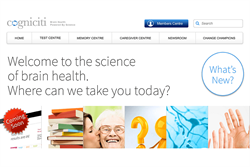 The Cogniciti Brain Health Assessment is an early-warning cognitive test developed by the researchers at Toronto’s renowned Baycrest Health Sciences, a global leader in memory and aging. The objective was to develop a simple, straightforward test that provides a yes/no answer to the question “Is my memory normal, or should I see my doctor?” This free assessment is aimed at adults ages 40-79 and is completely confidential. In addition to helping adults proactively manage their brain health, the test is playing an important role in developing the next generation of dementia therapies. Historically, researchers have focused on finding solutions for people suffering from Alzheimer’s disease. While this important work continues, new research is concentrating on helping adults who are at risk. Baycrest is a century old healthcare institute located in Toronto, Canada. It is Canada’s largest geriatric healthcare institute and a world leader in the research of memory and aging. It’s mission, and that of its business arm Cogniciti, is to bring brain health solutions to people, businesses, and governments around the globe. These solutions are badly needed to help the millions of adults with significant memory concerns get earlier assessment, diagnosis and treatment. To help the tens of millions of adults with normal memory loss find peace-of-mind and effective coping tools. To help family caregivers better support loved ones with dementia. And to speed the development of the next generation of dementia drugs. For more information, visit: http://www.cogniciti.com or http://www.baycrest.org. For more information visit: http://www.InnovationsTelevision.com or contact Michele Nehls at (866) 496-4065.